While fires, floods, and earthquakes pose significant threats to historic and cultural properties in California, many other natural and man-made disasters also have the potential to damage or destroy property within the state. Knowing the potential risks, anticipating them, and being properly prepared before, during, and after a disaster could mean the difference between the total loss of a resource and limiting or eliminating the resulting damage. Essential preparedness planning and mitigation are key factors in ensuring that historic properties are properly identified, evaluated, and treated immediately after a disaster occurs and in the recovery period afterwards. While disasters may be unpredictable, important steps can be taken before a disaster occurs to minimize the threat of damage. Disaster preparedness is everyone’s responsibility. Although it is important for local governments and jurisdictions to implement planning and mitigation measures before a disaster or emergency occurs, many of these measures should also be implemented proactively by local communities or neighborhood organizations or by individual owners of historic properties. Compile a list of key emergency contacts, determine which agency or what person is responsible for what activities and make the information widely available. Maintain adequate emergency supplies. With proper training and knowing what to do in the event of a disaster, emergency responders will be prepared to assist their neighbors and help protect lives and property. In spite of the number of resources listed in the California or National Registers, many of California's significant historic and cultural resources have yet to be identified and evaluated. Local surveys are vitally important for disaster preparedness planning. The pre-disaster listing in or a determination of eligibility for listing in the National Register of Historic Places will streamline the environmental and historic preservation review process in the event of any disaster undertaking on the property. This pre-disaster determination may be crucial in how the resource is treated when significant damage is incurred as the result of a disaster. Prior listing or determination will provide pre-disaster documentation of the qualified historic property to ensure a proper evaluation in any regulatory process impacting the resource, including the factoring of potential repair costs. All resources listed in or determined eligible for the National Register are automatically included in the California Register of Historic Resources. Resources listed in or determined eligible for the California Register qualify for a variety of preservation incentives. Assess vulnerability and determine risks. Perform pre-disaster rehabilitation and mitigation work, such as seismic retrofits or flood controls, to reduce potential impacts to historic properties. Set aside funds, adopt disaster ordinances, develop strategies and incentive programs to facilitate recovery efforts. Incorporate preservation planning into general, specific, downtown, redevelopment, etc. plans; planning and zoning regulations, and design guidelines. Develop local incentive programs to facilitate protection of historic resources. Planning a seismic retrofit improvement to your property? This letter from the State Board of Equalization of July 2010 summarizes the changes to the new construction exclusion for seismic safety improvements. The letter includes a sample exclusion claim form for local county assessors. Specific forms for each county can be found on most county assessor web sites. If the form is not available on your county assessor's web site ask for Exclusion Form BOE-64. 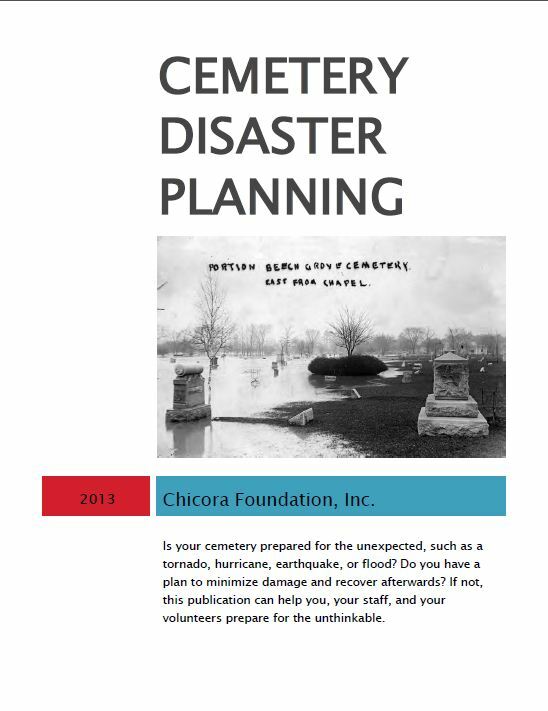 Chicora Foundation out of Columbia South Carolina has made this Cemetery Disaster Planning Booklet available for use. This booklet provides immediate advice on why and how to prepare a disaster plan for your cemetery, reviewing some of the more common cemetery problems, including hurricanes, tornadoes, flooding, and vandalism. It provides comprehensive and up-to-date information on recovery techniques, including FEMA funding. Standing in the ashes of the Dyer House at Cuyamaca State Historic Park four years ago, I could not believe any fire could be as terrible as the 2003 Cedar Fire. Completely gutted except for its stone walls, the Dyer House was not listed on the California Register of Historic Resources and therefore not eligible for Federal Emergency Management Administration (FEMA) funds for reconstruction. The 2007 fires in Southern California once again demonstrate the extraordinary need for surveys of cultural resources, especially in remote areas. Although very few historic buildings listed on federal, state, or local registers were lost in the seven stricken counties, the loss of hundreds of potentially eligible cultural resources was the worst in the history of San Diego County. Fire response for the protection of cultural resources was at times heroic. The South Coastal Information Center, in cooperation with Office of Emergency Services (OES) and the California Department of Forestry and Fire Protection (CALFIRE), through its sophisticated GIS mapping, produced fire maps showing the location of known historic and cultural sites for fire fighting teams. Protection of the life and safety of others in a disaster always comes first. But it was clear that when fire fighters were informed of the need to save a historic structure, they responded in remarkable ways. "Bombing" the Montecito Adobe near Ramona with fire retardant chemicals, while an inferno raced through the site, saved the historic building. But other historic resources like the Sikes Adobe and the Old Adobe Schoolhouse were completely gutted. Now is the time to undertake the task of statewide surveys, GIS mapping, and protection criteria for cultural resources areas with a high potential for natural disasters. The need for a greater inventory base of historic and cultural resources, with full and immediate GIS capabilities, cannot be overstated. Disasters are finite. The need for current, accurate information about historic resources is ongoing.